Timor-Leste, better known to Australians as East Timor, is one of the newer sovereign nations in the world, becoming independent from Indonesia in 2002. It also has one of the world's newest Australian football sides, with the Timor-Leste Crocs taking their name from a local legend about a crocodile who rescued a boy stranded in the ocean. When the crocodile stopped swimming, its body became the island of Timor, and the boy the first of the Timorese people. While footy has had an on-and-off-again presence in the country since around 1999, the new-look Crocs look like being here to stay, with plans for a development officer and recruiting underway to send a team of Timorese nationals to the Northern Territory FL's indigenous footy carnival in Darwin in October. Timor-Leste has a colorful past, spending centuries as a Portuguese outpost surrounded by the Dutch East Indies (now Indonesia). When the Portuguese left in 1975, the Indonesian government invaded and a resistance movement simmered until the eventual breakaway a quarter of a century later. Australian peacekeepers and aid workers have been heavily involved in helping get the country on track, with the island located just 640 kms north-west of Darwin. 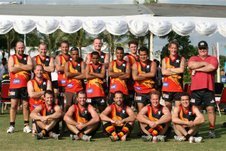 Two such Australian were Luke Gosling and Justin Bayard, who started the Timor-Leste Australian Rules Football Club in 2008. As Gosling tells us, "The forerunner was the East Dili Eels, a group of blokes who would kick the footy on a Thursday afternoon. So we have 2 teams, the National team known as the Crocs, and the Eels who form for training games". The Crocs currently have around 30 players on the books, including a mix of Timorese, Americans, Kiwis, Brits, and Australians. Among them are a few former Jakarta Bintangs and Bali Geckoes. Gosling tells us the club is currently around two-thirds Australians and one-third the rest, but they are working to recruit locals, and hope to have a development officer start in Dili before the end of the year. First priority is to get as much of an all-local team as possible assembled for the NTFL carnival. "We have been to the Bali 9s Masters and next is the pre-season Northern Territory FL Carnival in Darwin in October. I don't think we'll get an all-Timorese team ready in time, but we'll try, and even if we have some expats playing it will still be a great addition to the comp." "We also have plans for a game against the Bali Geckos in Kupang, West Timor, and the Asian Champs next year." "The NTFL are going to help us to get Australian Volunteers International on board to support a position for the Development Officer based out of Dili. We will start with some local teams in Dili, probably 9 a side on the soccer pitch and then train on a bigger ground prior to representative games." "Andrew Farley from NTFL has been great and is helping to get us to Darwin in October, and my brother Sam Gosling and the other guys with Bali Geckos." Also sponsoring the Crocs for their Bali 9s campaign were the Novo Horizonte Hotel, ANZ Bank and Tiger Fuels, with the club now searching for a major sponsor. Gosling is also the driving force behind the charity Life, Love and Health, which he and a friend started in 2002. Although LL&H's work is mainly focused on water supply and schools projects, it has included sports in the past. The 2004 Timor Challenge was a multi-sport adventure race held as part of the 2nd anniversary of independence. In 2007 they organised the "Ride for Peace", a mountain bike event where participants rode from an altitude of 2,500m in the mountains to sea level in Dili. As Gosling tells us, "We currently have a street youth project with a sporting twist - an International Street Soccer tournament at Federation Square in Melbourne in December 08 called the Homeless World Cup. There was no Timor-Leste Team, so we have had a selection program and are now putting the selected kids through some English language and other occupational training in Dili before getting them to Melbourne for the December event." "A great opportunity and they will also have an opportunity to train with the Crocs so they know how to have a kick of a real footy in Melbourne!" While the Crocs formed a few months too late to make it to the 2008 International Cup, a development officer onboard and the opportunity to play in Australia through the NTFL will hopefully see them a competitor of the future. President of Timor-Leste, Dr. Jose Ramos Horta, is presented with a framed Crocs jumper.